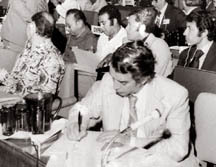 Perhaps the fifth Non-aligned Summit that Sri Lanka hosted in Colombo from August 16-19, 1976 was the biggest international congress that the country has ever witnessed. Elaborate preparations were made; various memorabilia such as coins were issued to mark the event. Roads leading to the main venue of the 5th Non-aligned Summit, the Bandaranaike International Conference Hall from the Bandaranaike International Air Port was decorated with the flags representing over 86 nations that attended the Summit. Apart from marking Sri Lanka on the international diplomatic map, the Summit left Sri Lanka with a host of nostalgic memories. The luxurious apartment flats constructed to host the national leaders and their representatives are still called "Summit flats" and serve as living monuments of Sri Lanka's hour of pride. It was Asia's turn to host the Nonaligned Summit exactly fifteen years after the establishment of the movement. The first Summit of the Nonaligned Movement was held in Yugoslavia followed by three others held in the African continent; The 5th Summit of Nonaligned Countries, was held in Colombo, Sri Lanka August 1976. The then Prime Minister Sirmavo Bandaranaike chaired the Summit which was attended by 86 countries. 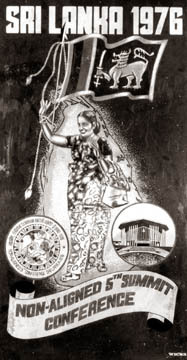 It was widely considered as a diplomatic triumph of Sri Lanka and that of Madam Bandaranaike, who was the world's first woman Prime Minister who marked her name in the international arena of diplomacy by actively intervening to settle the Sino-Indian border dispute and successfully reaching an agreement with the Indian Prime Minister Lal Bahdur Shasthri on the dispute over the Tamils of Indian origin. She was a patriate in a true sense. The Colombo Summit was significant in that it paved the way for the emergence of a new economic order which had became a focal point of the Movement and helped advance the de-colonization process around the world. Among the deliberations made at the Colombo Summit were the group agreed and committed to uphold the principles enunciated by the Movement and committed to work to ease international tensions, and promote disarmament and peaceful coexistence; aspirations that have always been part of the foundations of the policy of non alignment to contribute to world peace and security, as well as to the people who were still fighting for their liberation and against foreign occupation. The Palestinian cause, Argenita's sovereignty over the Falklands occupied by Great Britain as well as Panama's sovereignty over the inter-oceanic route controlled by the United States, the support for the decolonization process and the denunciation of a fascist dictatorship established in Chile by a military junta headed by coup leader, General Augusto Pinochet, stood out among the issues tackled in the Summit. The participation of nationalistic, Panamanian leader, Omar Torrijos, was particularly memorable. He thanked the Movement for its solidarity with the Panamenian peoples' fight to recover their Canal and he expressed his confidence in that group of countries to represent the true interests of the Third World in the international arena. On that very issue, Sri Lankan Prime Minister Sirimavo Bandaranaike, affirmed that the nonaligned movement had always been the most powerful weapon against all the world's tyrannies, especially those which have tormented the Third World, which for five centuries endured misery and hopelessness. Among the other hosts of souvenirs and memorabilia, Sri Lanka issued two commemorative coins in the denominations of Rs.5 and Rs.2 respectively. The coin carries an image of BMICH and the word 'Non-Aligned Nations Conference' and the year of issue '1976' at the bottom. The next NAM summit was announced to be held in Cairo, Egypt. Afghanistan, Algeria, Angola, Antigua and Barbuda, Bahamas ,Bahrain, Bangladesh, Barbados, Belarus, Belize, Benin, Bhutan, Bolivia, Botswana, Brunei, Burkina Faso, Burundi, Cambodia, Cameroon, Cape Verde, Central African Republic, Chad, Chile, Colombia, Comoros, Congo, C'oe d'Ivoire, Cuba, Democratic Republic of Congo, Djibouti, Dominica, Dominican Republic, Ecuador, Egypt, Ghana, Grenada, Guatemala, Guinea, Guinea - Bissau, Guyana, Haiti, Honduras, India, Indonesia, Iran, Jamaica, Jordan, Kenya, Kuwait, Laos, Lebanon, Lesotho, Liberia, Libya, Madagascar, Malawi, Malaysia, Maldives, Mali, Mauritania, Mauritius, Mongolia, Morocco, Mozambique, Myanmar, Namibia, Nepal, Nicaragua, Niger, Nigeria, North Korea, Pakistan, Palestine, Panama, Papua New Guinea, Peru, Philippines, Qatar, Rwanda, Saint Lucia, Saint Kitts and Nevis, Saint Vincent and the Grenadines, Sao Tom, and Pr­ncipe, Saudi Arabia, Senegal, Seychelles, Sierra Leone, Singapore, Somalia, South Africa, Sri Lanka, Sudan, Suriname, Swaziland, Syria, Tanzania, Thailand, Timor Leste, Togo, Trinidad and Tobago, Tunisia, Turkmenistan, Uganda, United Arab Emirates, Uzbekistan, Vanuatu, Venezuela, Vietnam, Yemen, Zambia, Zimbabwe.